The foreign stars of the cinema, one after the other, come to France. Douglas Fairbanks and his wife Mary Pickford, and for ‘England the blonde’ Pearl White have already come smiling in the flesh to the enthusiasm of the crowds – under the Parisian sky. 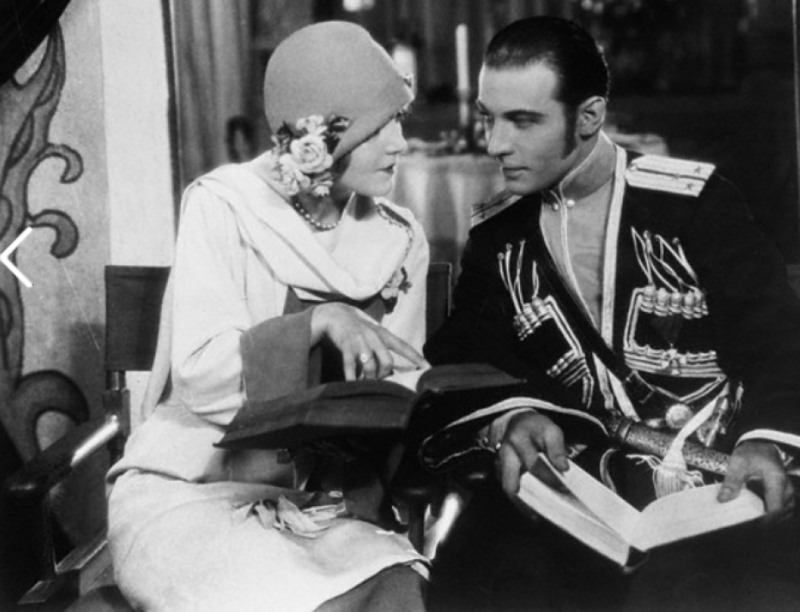 Yesterday, in its turn, a new star descended from the clouds, Rudolph Valentino, Prince Charming of the cinema and his charming wife Natacha Rambova. All of the famous silent film stars are in Paris. Mr. Valentino is having some rest before going back to New York to finish filming and judging an American Beauty Contest. The adoring crowds designated him as the most handsome man, was celebrating with his equally famous friends. The evening, in fact, a grand-banquet was setup for his party in the hotel. An international star, much more than American, Rudolpho Gugliemi was born in Castellaneta, and is actually called Rudolph Valentino. Eight years he went to America, started living a real movie; episodes by turns dramatic or triumphant. Dancer, then screen artist, he knows about Americans – and especially American cars – a vogue almost eclipses that of trolleys. Thus, after very romantic difficulties, he married, two years ago, the daughter of the perfume king, Mr. Richard Hudnut who goes by the name of Natacha Rambova. The photo taken shows Valentino, followed by his wife getting off the plane, at, Bourget. The arriving party will be going to Paris. Mr. Jacques Hébertot, Director theater of the Champs-Elysées, which is in Paris, France, in charge of his interests, has engaged him. Rudolph Valentino will come to make his own pictures. In the meantime, a copy of the first cut print of “A Sainted Devil” made for Paramount, will be forwarded to Rudolph Valentino at Juan Les Pins, Antibes, France. Mr. Valentino sailed the day following completion of his work in the production at the Paramount Long Island Studio, has not seen the completed picture which was filmed under the direction of Joseph Henabery. The picture is now being cut and edited under the supervision of director and E. Lloyd Sheldon a supervising editor, and when the work is finished at the end of week, a print of the completed film will be forwarded to France where the star is spending a short vacation. Heirs of Rudolph Valentino are still collecting royalties from his pictures more than eight years after his death it was revealed in court today. Two of the late actors greatest films “Son of the Sheik” and “The Eagle” are still shown in theatres throughout the world, the administrator of his estate informed Probate Judge Walton Wood. The court was asked to approve a compromise settlement of $6,093.75 with Art Cinema corporation as royalties due to the estate. The court concurred.